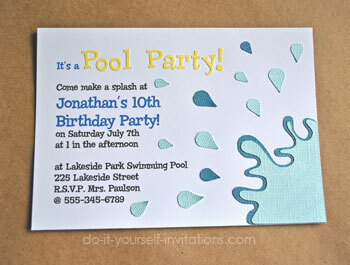 Make these pool party invitations for your upcoming summer parties! The pool party is the epitome of a summertime bash, but these could be used for a variety of summertime "splash" parties! What immediately comes to mind is a water gun party, a slip and slide party, or even a water balloon fight party! All fantastically fun ideas! 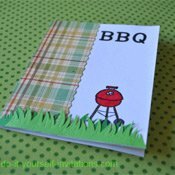 These invites are both simple and easy to make. 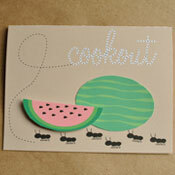 I have included a few template and pattern pieces to help making these invites a snap. I really hope you enjoy them! Making these DIY pool party invitations is pretty simple. The number of steps involved are few, but there are a few different ways to go about it. I have included some files for all of you die cutting divas out there! But if you don't have a personal die cutting machine, do not fret! I also have a printable PDF file template that you can simply print onto the back of your colored cardstock and then trim with a good sharp pair of scissors! Experience tells me that this will look just as cute on the finished product as the die cut pieces. It just takes a little bit more effort. Step 1: Start by creating your 5 by 7 invitations using our free printable invitation templates. Use the template to format your invitation wording. To use the template simply download the file and save it to your desktop. Open the file, place the cursor on the page and start typing up the wording for your pool party invitations. You can change the fonts, text color and sizes by pressing Control and E at the same time and using the typing tool pop-up. Print the file onto some standard white cardstock at your printer's highest quality settings. You may want to leave out the wording "Pool Party" from the printed invitation if you intend to use a die cutter or paper punch to create the letters for this. Although, it will look nice to print the words in some nice bold colors as well! Step 2: Trim the paper to 5 by 7 invitations using the nifty cutting guidelines on the print out, and using a personal paper trimmer. 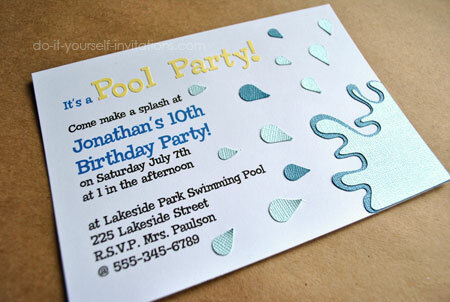 Step 3: Add the splash and water drops to the pool party invitations using either a personal die cutting machine or by printing our pdf file pattern template onto the back of some blue colored cardstock, ad trim the shapes with some scissors. Water Splash Jpeg File - just click on the link and the right click to save. Water Splash SVG File - for use with Sure Cuts A Lot software. Water Splash PDF File - for printing or exporting to die cutting software. Make sure to cut the larger Wave/splash piece in a darker blue, and the smaller piece in a lighter shade of blue. The water drops should be in both colors. Step 4: Glue the smaller. light blue splash to the larger dark blue splash, aligning them at the straight edges. 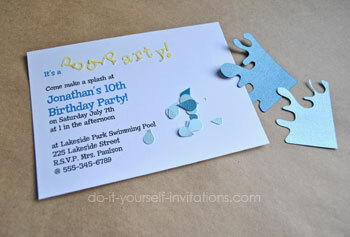 Apply some glue to the back and attach the two splash pieces to the lower right hand corner of the invitation. Next arrange the water drops and glue them all over the invitation to look like the water is splashing across the invites. A great optional step is to pick out some matching decorative paper and create some crafty envelope liners for the invitation envelopes!